I'll give this four stars because it is an informative history of Mrs. Parker's later years and afterlife adventures (not spoiling that, you'll have to read it). As noted elsewhere here, the title may mislead you because this short work tends to focus more on Lillian Hellman than Dorothy. Likely it's because Hellman outlived her "frenemy" by twenty years and kept her nose in Mrs. Parker's estate even when she was longer executor. Sour grapes sparked a long, bitter revenge through catty memoirs and purposeful quashing of literary projects, all because Hellman didn't get her way. If you've long admired Hellman as a writer and a person be warned, she doesn't come out well in this. 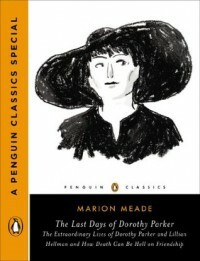 Nonetheless, I've found this a very helpful resource on Mrs. Parker.